The Nov. 8 typhoon killed more than 6,100 people in the eastern Philippines, displaced at least 4 million others and left a country in ruins. TACLOBAN, Philippines — Christmas lights blink in a handful of restaurants in Tacloban, but at nightfall, much of this city flattened by Typhoon Haiyan slips into darkness. A few downtown shops have reopened. Roadside vendors peddle fruits of the season: oranges and red apples. There is rebuilding, though much of it consists of residents hammering shelters out of scavenged debris. The Nov. 8 typhoon killed more than 6,100 people in the eastern Philippines, displaced at least 4 million others and left its most gruesome mark on Tacloban, a city of 240,000 that will need years to recover. Soon after the storm, Philippine Energy Secretary Jericho Petilla promised to restore power by Christmas Eve or resign, and indeed, electricity has returned to nearly all of the more than 300 towns that lost it. But relatively few people are able to use it. Officials say many storm-ravaged houses and shops will spend the holidays in the dark because their wiring systems are damaged. City Hall, a seaside hilltop complex surrounded by ruins, buzzes with typhoon relief work, with dozens of staffers and foreign aid workers busy on the phone or huddled in talks. “I am hoping by a year you’ll see some significant improvements,” Mayor Alfred Romualdez says. But he’s not sure when his city will fully bounce back. Christmas Day Mass here will be celebrated by the papal envoy. There will be a Christmas Eve dinner for foreign aid workers and local officials. But mostly, Christmas will be a celebration amid deprivation, in tents, makeshift homes and damaged churches. The smell of death remains in parts of the city. Thousands of people have simply left. Fire officer Rolando Unay gently lifts a black cadaver bag left on a roadside by villagers in Tacloban city. “It’s a child,” he tells his team of corpse collectors. As their orange dump truck cruises along a main road adorned with Christmas trees, motorists and passers-by cover their noses. More than six weeks after Typhoon Haiyan struck, leaving well over 2,000 people dead in Tacloban alone, this sad work continues. Soldiers, police, firefighters and volunteers have cleared what had been a heartbreaking landscape of bodies strewn across the ruined city, but the stench in scattered mounds of debris means there are more left to find. Unay, a doting grandfather with five children, says that although the work is difficult he sees the good in it. “Every time I lift a child’s body, I could feel that the agony of a parent, a family somewhere, is about to end,” he said Friday. At a corner, a distraught fisherman, Hubert Labanan, waves at Unay’s truck to stop. He points to the remains of his mother by the roadside. Villagers found her remains under a pile of wood and other debris that they cleared while preparing to repair a house. Holding back tears, Labanan tells Unay’s crew that he had lost his own home in the storm and was too poor to bury his mother in a cemetery. He begged that she be taken to a mass grave. As Unay’s team left with his mother’s remains, Labanan waved goodbye, then stood motionless until the orange truck vanished from his sight. In early November, Eledio Moro thought he had Christmas figured out. He was going to surprise his 2-year-old daughter, Aubrey, with a pink toy motorbike. For his wife, a gold bracelet, or maybe an expensive Western-brand shirt. He owned a restaurant and a money-lending business. His new house was one of the grandest in the poor coastal neighborhood. Last year, he draped it in the best and brightest Christmas lights. “We worked hard and were doing well then suddenly, like a bubble that burst, I lost everything,” he says. Like many in Tacloban, Moro ignored an order from authorities to evacuate as Haiyan approached, thinking his house could withstand the storm. He and his family were huddled by the staircase when a cargo ship, swept inland by the massive storm surge, smashed into the house, knocking them into the water. He survived by grabbing a piece of bamboo. Now all that is left of his home is the staircase, a wall and a second-floor balcony beside the huge, steel-hulled ship, still stuck by the road. Moro, 41, now lives with his sister. Sleeping tablets have helped him get through the worst of the past six weeks, he says. Although its roof got blown off by Haiyan’s wind and it became a burial ground for dozens of typhoon victims, the Roman Catholic cathedral in Palo, near Tacloban, hosted a festive event a day before Christmas: the mass wedding of 98 couples. Originally scheduled for 147 couples on Nov. 16, the wedding was postponed when the monster storm struck, damaging the church’s interior, breaking its stained glass windows and scattering its pews. A smaller number registered for Tuesday’s ceremony, apparently because the other couples left the region after the storm, said Monsignor Bernie Pantin, who officiated the wedding. “I praised them for their strong faith whatever happens,” Pantin said. Workers draped the roof with tarpaulins ahead of Christmas but part of the altar still got wet from a downpour later Tuesday. 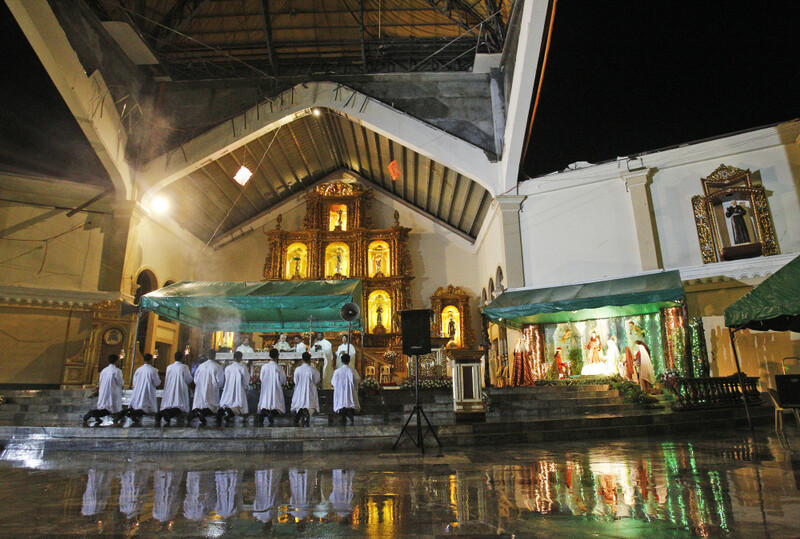 Archbishop Giuseppe Pinto, the papal envoy to the Philippines, was to celebrate a Christmas Eve Mass at the damaged cathedral. At night in Tacloban’s dark and dreary downtown, Joseph Bonavitacola’s restaurant is filled with chatter, mostly of foreign and local aid workers. His brick oven hardly gets any rest. Red Christmas lanterns, lights and decor adorn window panes and a brick wall at Giuseppe’s, which has the ambiance of fine dining in Manila, the Philippine capital. It’s hard to imagine how the Italian businessman, who has lived in the city for 20 years with his Filipino wife, reopened the place less than three weeks after Typhoon Haiyan devastated about 4,000 businesses. Only about 5 percent have reopened, officials say. Frightened by a jailbreak and lootings, he left for Manila with his family but returned after three days to start a massive cleanup with 20 employees. He fixed damaged equipment and got supplies from another branch of his restaurant. Despite a power outage, he reopened Nov. 24 with candlelit tables. His message, exclaimed on a big sign outside: Rise Tacloban. He also owns 10 meat shops that were inundated, and has begun to reopen them, keeping prices at pre-typhoon levels. Outside his crowded restaurant, armed policemen stand guard. Most nearby shops remain shut.